Sanitary Conveyor meets food product handling needs. Offering CIP (clean in place) and COP (clean-out of-place) options, stainless steel Sanitary Level IIIÂ Â may be used to convey starched food or raw food product. This all-welded, bead-blasted, sealed tube conveyor isÂ engineered for extreme caustic wash down procedures. While belting features endless solid polyurethane composition with minimal tension, use of sprocket and gear drive without hinge points optimizes sanitation levelsÂ and minimizes maintenance. Oshkosh, Wisconsin Nercon Eng. 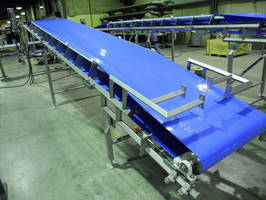 & Mfg., Inc. is showcasing a new sanitary conveyor design at Pack Expo – Chicago, Booth N4036. Pack Expo is one of the largest process and packaging shows in the world, is being held at McCormick Place-Chicago, Oct. 28 – 31, 2012. The stainless steel Sanitary Level III design is an all welded, bead blasted, sealed tube conveyor design. This conveyor construction level may be used to convey starched food or raw food product and is engineered for extreme caustic wash down procedures. The belting features an endless solid polyurethane composition, with low tension. The use of a sprocket and gear drive without hinge points provides optimal sanitation levels in handling raw foods as well as reduced maintenance. Featuring CIP (clean in place) and COP (clean – out of- place) options, the Sanitary Level III design is evidence of the trend for food manufacturers to increase cleaning efficiencies. The design provides the highest degree of sanitation compliance, low-maintenance and reduced food risk. Nercon, based out of Oshkosh, Wisconsin, is a leading manufacturer of conveyor equipment for food manufacturers.